50 page teacher's resource book. This practical spelling programming book has been designed with the most important planning frameworks, activities, term/year overview, signs, dictation sheets, spelling planners, phonemic awareness skills, spelling, general spelling skills sheets and loads more. Designed from a teacher's perspective these planning frameworks and helpers can be used in a range of classroom settings. As we know the acquisition of spelling in the early years is highly important and we seldom get the chance to research spelling learning experiences. A colored Look, Say, Cover, Write, Check Strategy card. A range of 'have-a-go' cards/pages for different abilities. 'Words I know' pages for various ability levels. My very own spelling folder cover page for the above pages. 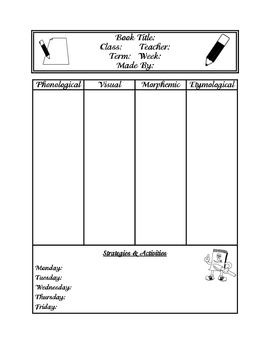 Spelling words planner with phonological, visual, morphemic and entomological columns as well as space for weekly activities. 2 different pre and post class spelling test tracking sheets. 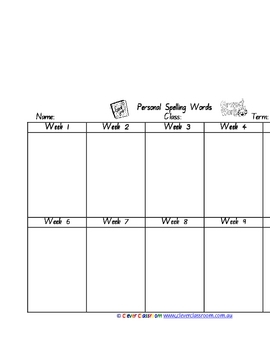 Weekly spelling words sheets, topic/theme words sheets personal lists sheets for student and teacher. 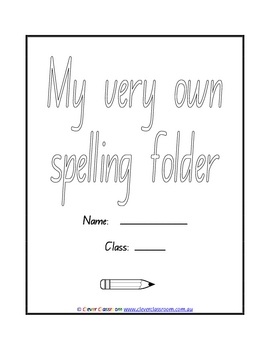 A range of blank spelling overview sheets with space for strategies and activities. 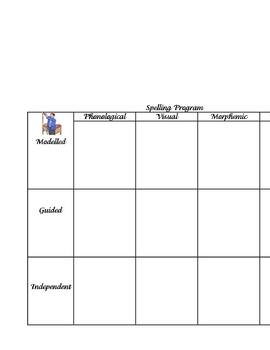 Spelling program sheets to allow for modeled, guided and independent learning. Overview of 15 phonemic awareness skills and strategies eg sound discrimination, chunking, substitution etc. (strategies listed) and space for either experiences or to track when taught e.g. with a date of week/term number. Overview programming sheets for 40 general spelling skills e.g. synonyms, diphthongs, morphemes, compound words, double sounds, silent letters, vowels sounds, prefixes, etymology, onomatopoeia and lots more. A Jumbo list of 115 classroom spelling learning activities for the very busy teacher. These activities range from whole class, small group, pairs, and individuals. They are fun, hands-on, practical and easy to prepare. 4 levels of dictation cards for different spelling/writing abilities. 12 spelling signs for your classroom like; spelling words, spelling list, topic list, etc. Designed by Clever Classroom, 2009.